Have you ever had this happen… you want to make a quick batch of treats to surprise someone, but you’re just too busy to bake a cake and crumble it up for cake pops? 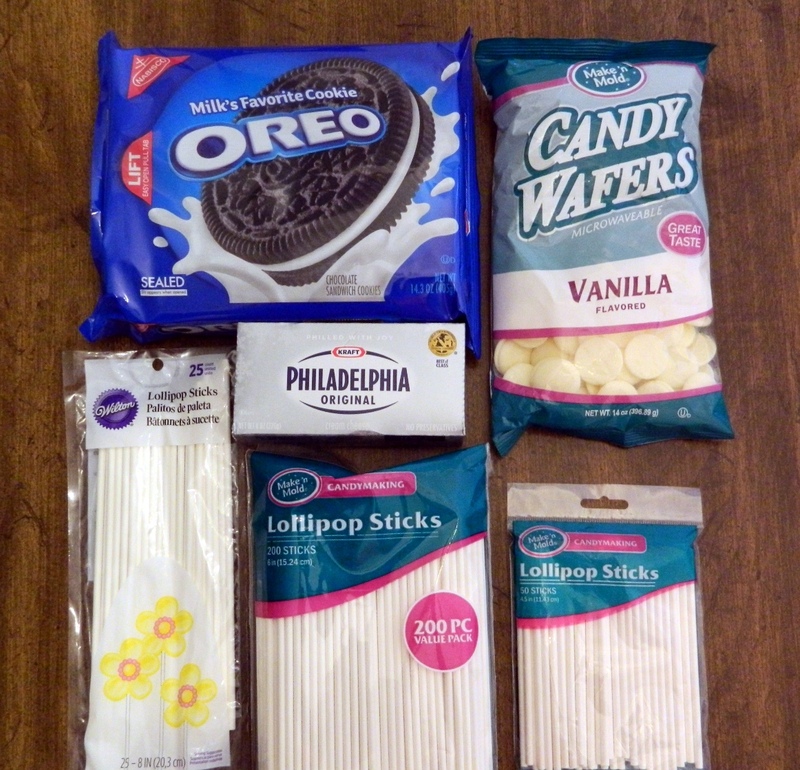 Oreo Pops are one of my favorite things to make when I don’t have a lot of time to bake, but I want to make something sweet. They only require 3 ingredients, and are quick to assemble! This entire project can be done in under an hour (if you don’t stop to take pictures every 5 seconds like I do) and it doesn’t require any baking whatsoever – bookmark this post for the summertime when its too hot to turn your oven on. Place the entire package of Oreo cookies into the food processor. If you don’t have a food processor, place cookies into a large Ziploc bag, and use a rolling pin to smash them up. Crush the cookies until they are fine crumbs. Mix in about a 1/2 block of cream cheese (4 oz.). If the mixture isn’t holding together, or it seems dry, add in a little more cream cheese. Roll balls as if you were making cake pops. Using a 1.5″ cookie scoop, this will yield 20-24 pops. 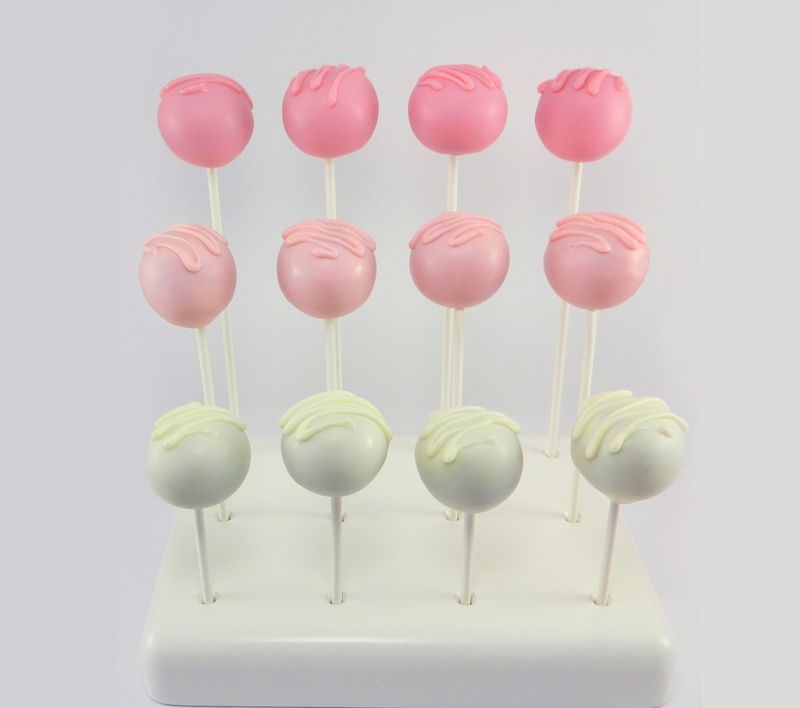 To create tiered cake pops, you don’t need a big, expensive set-up… grab your favorite KC Bakes stand and some different length lollipop sticks. For this project, I used 8″, 6″ and 4″* sticks. The Oreo balls only need to be refrigerated for about 5 minutes. 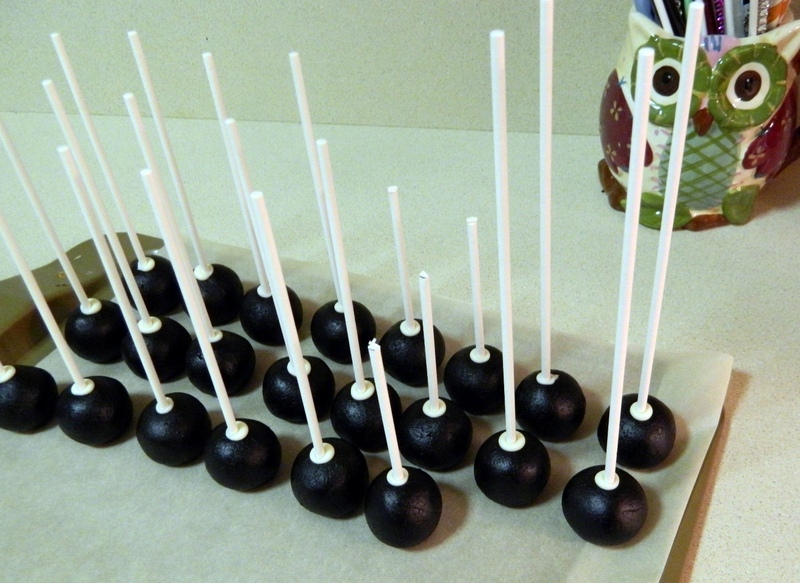 Dip the sticks in melted chocolate before inserting them into the Oreo ball. * I accidentally bought 4.5″ sticks, but didn’t realize it until I got home (d’oh!). So, I measured & trimmed mine down so they’d all be evenly spaced 2″ apart. 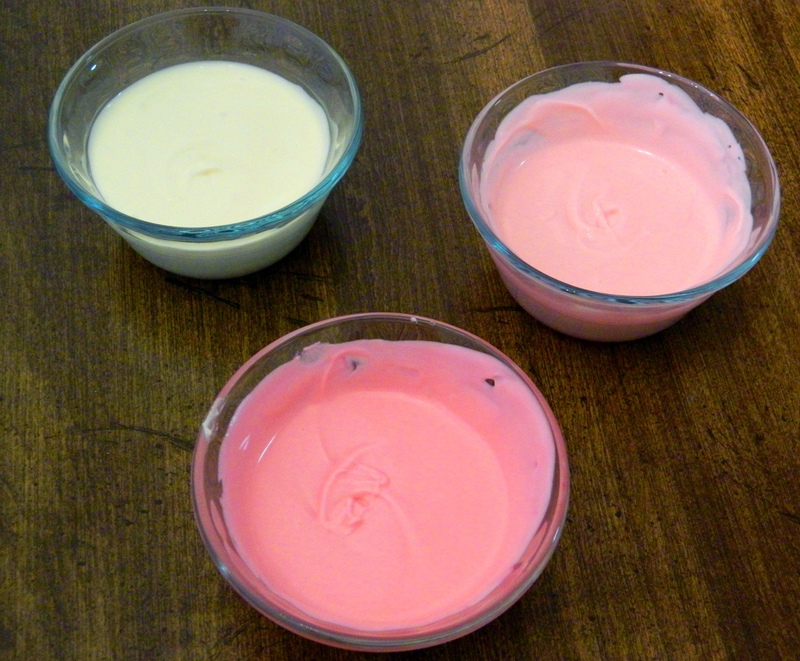 For that beautiful ombre effect, divide melted white candy into three bowls. Using oil-based candy color, add a drop of dye to the first bowl & stir it in thoroughly — these dyes are very concentrated, so a little bit goes a long way. Then in your next bowl, add a little bit more dye to get a hue just a few shades darker than the first. Be cautious not to make your colors too drastically different from one another… the definition of ombre is to have colors that fade into each other, graduating from light to dark. Next, assign candy colors to the different stick lengths. 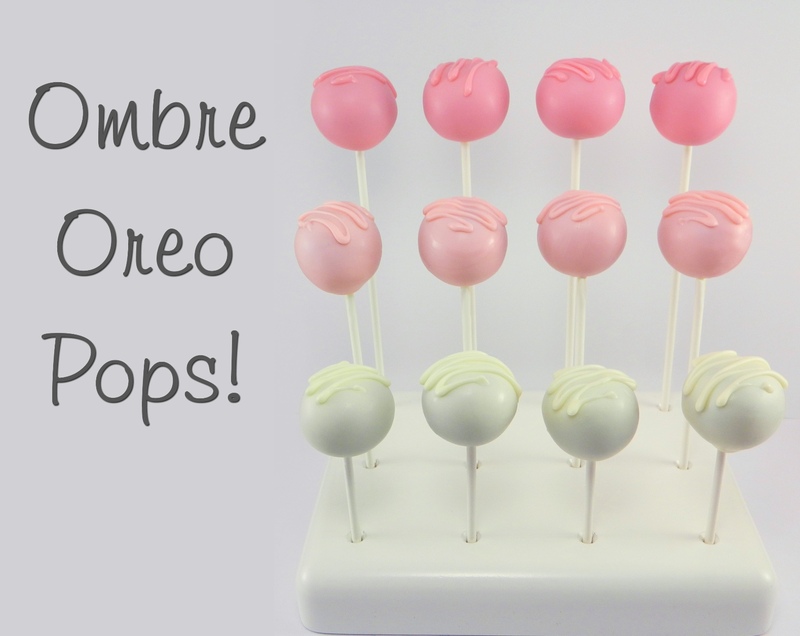 Top these pops off with a drizzle of the same color melted candy. Contrasting drizzle or colorful sprinkles will take away from the soft subtly of the ombre. This technique can be used with any color to give your party desserts a modern flair. Just remember to fade your colors gradually for that true ombre beauty. Did you enjoy this tutorial? Make sure you don’t miss the next one! Subscribe to my blog by placing your email address in the top/right corner. Thanks for reading! Thanks for sharing at Two Cup Tuesday at Pint Sized Baker. I’ve pinned it!